National average rent growth in July was 0.1 percent month-over-month and 2.6 percent year-over-year. While home prices continue to rise at breakneck speed, average rent growth has slowed to 0.1 percent month-over-month and 2.6 percent year-over-year. In dollar amounts, that results in a meager $1 increase in rent from June to July. 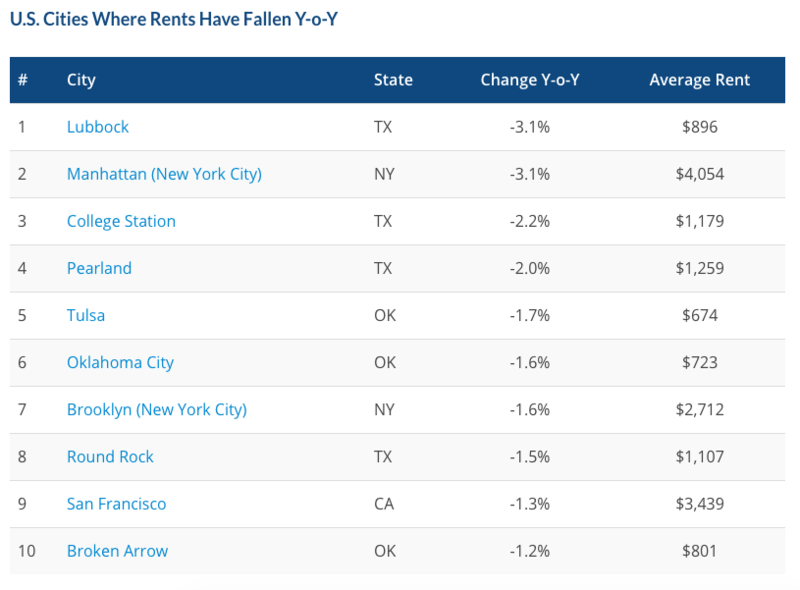 Renters in New York and Texas experienced the largest decreases in monthly rent, a much-needed reprieve for some of the most expensive markets in the U.S. According to RentCafe’s Yardi Matrix analytics, Manhattan rents decreased 3.1 percent year-over-year thanks to elevated levels of construction. In Manhattan, 7,023 more units are expected to be completed by the end of 2017, which has resulted in a $100 decrease in rent since January. In Texas, the college towns of Lubbock and College Station have experienced 3.1 and 2.2 year-over-year decreases in rent, respectively. Both cities have aggressively ramped up construction with College Station increasing its apartment supply by 300 percent in less than one year. Concurrently, rental prices California, Washington, Nevada and other parts of Texas are rising by 9 percent to 18.1 percent month-over-month. 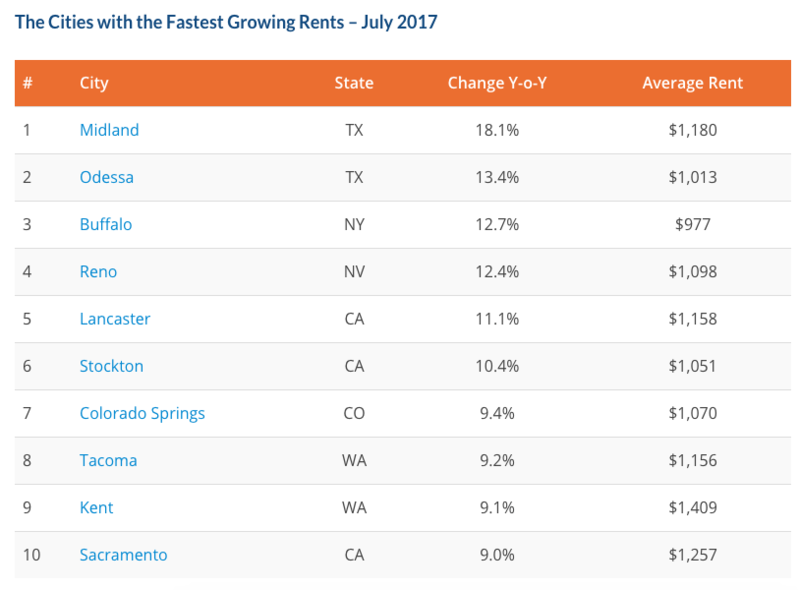 The city with the highest rental growth, Midland, Texas, can accredit it’s staggering 18.1 percent month-over-month growth to a strong job market and rock bottom unemployment rates. Texas has added more than 319,000 jobs in 2017, and Midland currently has the second-lowest unemployment rate in the state at 3.5 percent. In the past seven years, the town has grown by 25,000 and rental construction simply hasn’t been able to keep up. But the growth in monthly rents has pushed residents toward homeownership — 67 percent of residents live in owner-occupied housing. When it comes to affordability, cities in the South and Midwest continue to offer the lowest rents and costs of living. Wichita, Kan. has the lowest average monthly rent of $642 — $3,412 less than the highest average monthly rent of $4,054 in Manhattan. To compile this report, RentCafé’s research team analyzed rent data across the 250 largest cities in the U.S. The report is exclusively based on apartment data related to buildings containing 50 or more units.